For August at Modern Alternative Health, we were talking about News. And my favourite health news item that came to my attention during August was this video about choral singing and its potential impact on heart health. Inspired by the video, I did a bit more research and found a few other interesting studies and ways that music can help your health. You can read about my findings over here. When you’ve lived somewhere all your life, there are certain things you take for granted. And recently I’ve realised that one thing I took for granted in New Zealand was NZ Post. I was pretty sure that when someone sent me something it would arrive and vice versa. Sure, if it was from overseas, it might take forever (we are practically at the end of the earth after all). And if it was international, it would likely cost a bomb (end of the earth again) unless you were lucky enough to find a website that offered free worldwide shipping. But basically, it was reliable. My worst experience with the New Zealand Post was when I stupidly sent some concert tickets that I had sold on Trade Me by standard mail. It was Fast Post, but 3 days later hadn’t arrived. The concert was fast approaching, and I was about to leave New Zealand for Brunei, so tracking untrackable mail was the last thing I needed. It resolved on the fifth day, when they arrived safely. Overall, hardly an ordeal. You could say that NZ Post has been good to me. When I arrived in Brunei, people warned me that the post here was not quite so good. I wasn’t sure what to expect. “I ordered something from the UK and it took FOUR WEEKS to arrive” someone told me. I scoffed, and thought “well, that’s not bad at all”. My first experiences receiving and sending post were positive. My letters and parcels arrived (albeit slowly). The letters I sent arrived too. “This isn’t so bad”, I thought. I ordered things to our home address instead of Damian’s work (I don’t actually know if the work address is any more reliable, but it felt that way). I bought books from the Book Depository. I ordered from Etsy. I gave out our address to people, who were awesome enough to attempt to send us gifts and letters. And now? Now I am waiting on (at least) five parcels and an air letter. Most of the parcels are without tracking numbers. But the one tracking number I do have shows the parcel leaving Los Angeles on July 17th, and hasn’t been seen since. Basically, things aren’t looking good. I gave them a pass, because it was Ramadan. But that ended three weeks ago now. So I really have no idea where my parcels are. I am hoping some are in the local post office, but for some reason my little notification has gone missing (really must follow that one up). But I’m also starting to accept that they may never arrive. It’s a bummer really, because I would love to have a post I could rely on. I would love to send letters that I knew would arrive, and I would love to know that if my friends and family are nice enough to send me a package that I would actually get it. I would love to be able to order things online, and not just be throwing my money away. But, at the end of the day, it’s not too bad. It stops me shopping online, meaning that if I can’t get it here, I can’t get it at all (and there are quite a few things that I can’t get here). It means that when a package or letter does arrive, I am even more impressed and delighted. And when we eventually do go home, it will mean that I appreciate the relative reliability of New Zealand Post that little bit more. What with two great holidays, one horrid cold, and a whole lot of laziness on my part, it’s been a while since our last weekly challenge. When I left for India, I had grand plans of continuing the challenges while I was away. The first week that I was gone was a joint challenge week. But being in different countries wasn’t going to stop us. No way! We would just have to be a bit creative. You see, the thing is that when you’re on holiday you lose track of the days. So by the time I realised that it was Friday, and the right day for my challenge, it was late at night, and we were in bed, resting before our morning yoga the next day. We were stuck at our (admittedly amazing) yoga retreat, and didn’t really have anything in the room that could count for a challenge. I knew that The Engineer would have forgotten too (and I was right). But when we talked about it a little later, we realised that both of us had tried new things that day. And it doesn’t matter that there aren’t any photos to prove it. The Engineer’s ‘something new’ was going to Oz Sportz. The group started out as a group of Australians and New Zealanders in Brunei who gathered to watch antipodean sporting events. But, friendly as those from down under are, the group soon expanded to include anyone who wanted to come along. And has basically become an excuse to get together and have a few drinks. We’ve been told about it so many times since we arrived, but the regular Sundowners have always coincided with us being away or being forgetful, so we hadn’t made it. Until the Friday of the challenge that is, when The Engineer and some of his work colleagues headed along. From the sounds of it, it’s nothing too exciting. But it’s socialising in the way we’re used to – with booze. And we’re not going to complain about socialising with booze. I’m sure that when they kick off again in the new school year, we’ll head along again. My ‘something new’ was quite different. I was in India, so you could argue that most things I was doing were pretty new. The Friday of the challenge was the start of my first yoga retreat, my first time on an Indian bus, my first Indian street food. But the thing that really felt new to me was my first ride in a tuk-tuk (/rickshaw/auto/whatever you want to call it). The fact that I’ve never ridden in one before just goes to show how little I’ve travelled around Asia. Despite living here for six months (!) now, we’ve mostly been in Malaysia and Brunei, neither of which are keen on that kind of transport. It’s cars and motor bikes all around here. So on that Friday morning, I was pretty excited to catch one to the bus station. The ride was, frankly, underwhelming. It was breezier and bumpier than a car, and I couldn’t see as much of what was going on on the road. But it just felt pretty normal. The roads in India are pretty crazy anyway, so being in a more open form of transport doesn’t really make that much difference. And of course after that first ride, there were many more tuk-tuks to come (both in India and in the Philippines). After a while it just feels like the normal thing to be doing. But I guess that’s the thing about these challenges. Once you’ve tried them, they just don’t seem so different anymore (except for the century egg, that one really was weird). All the differences that strike you when you come to a new country quickly become the new normal. And the more things you try, the more it seems normal to be trying new things all the time (and the less you need a challenge to make you do it). This isn’t the end of our challenges, no way. But it’s been a good chance to reflect on what’s weird/new/different, and what has just soaked into our psyches as normal. This week the challenge cycle starts again, with my challenge for The Engineer. So let’s just forget how many we’ve missed, okay? And I’ll be back soon with more holiday updates. Because neither of us took photos of our ‘something new’s, here’s a picture taken on the day of the challenge. 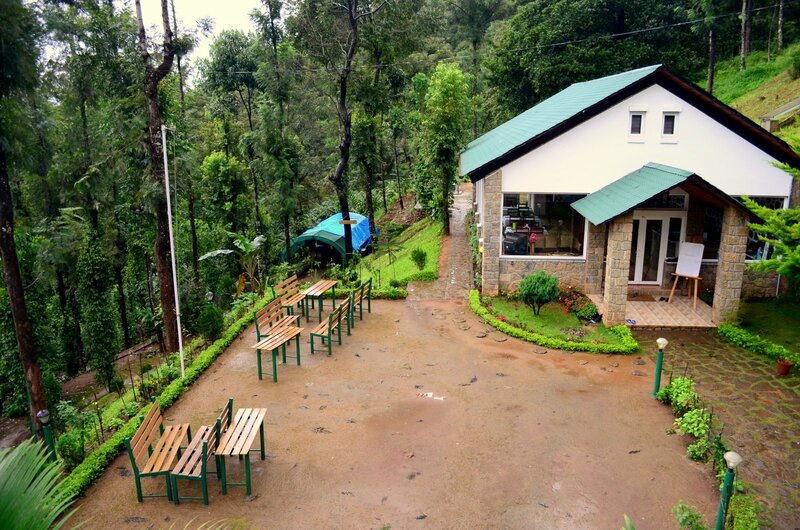 Of the very beautiful Kaivalyam Retreat in Munnar. A week ago today, I started my journey back from India. We were delighted to have 24 hour checkout at our last hotel, and the fact that we’d arrived at 6:30pm was just perfect. We explored all day, came back to the hotel, packed (which was slightly challenging given all my purchases), checked out, went out for dinner, took a rickshaw to the airport, and went through all the formalities (with two small hiccups in the form of a too heavy pack, and some scissors in my carry-on from repacking said pack). The plane left at 11:30pm, and 4 hours later arrived in Kuala Lumpur at 6:20 am. We had 6-8 hours in KL, during which we tried to sleep briefly (until we got told off), and generally sat around feeling a bit cranky (as 2 hours of sleep in a night is bound to make you). Eventually (after a Filet o’ Fish for breakfast and rather too many cookies), I was in the air again, headed to Miri. My flight arrived too late to catch the last bus to Kuala Belait, so I waited there (with some Marrybrown and some Starbucks) until The Engineer could get away from work to pick me up. When he arrived, I was half hyperactive/talkative, and half exhausted. I think the talkative mostly won out though. We made it through the border quickly, picked up some kebabs for dinner, and blobbed out with Despicable Me on our shiny new TV. I (of course) fell asleep and missed half the movie. And then (of course), I couldn’t sleep properly when I actually got to bed. The next morning, I woke up with a niggling sore throat and slight cough. I had hardly slept, so I was pretty tired. The ‘coming home tasks’ were put off for another day. The next day, the cough and sore throat were worse, so they were put off for another day. Then another and another. And suddenly it was today, and we are leaving for the Philippines at some ungodly hour tonight. Long story short, I came home from India, got a nasty cold, watched way too much TV and didn’t do enough of anything else. And now I’m going away again. Which means everyone has to wait for the Grand India Update (as well as the Weekly Challenge backlog). But I’ll leave you with one teaser. 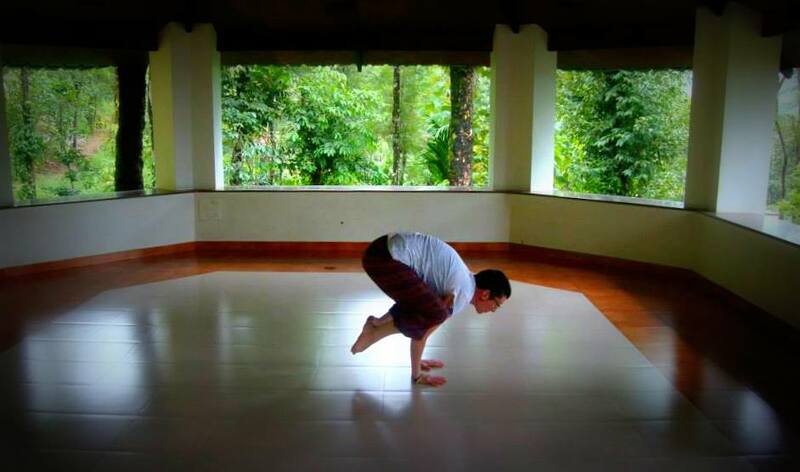 A picture from my sister of me practising my crow pose in the absolutely beautiful yoga hall at Kaivalyam Retreat (near Munnar, Kerala, India). Our week there was rainy and cold, but amazing. And the yoga hall was definitely one of the highlights of the trip for me. And when I get back next time, I’ll have even more updating to do. And hopefully no more nasty cold!